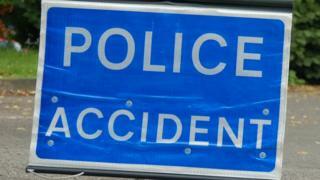 A man has been seriously injured in a road crash on Anglesey. Police received a report of a one-vehicle collision on Wednesday involving a blue Citroen Saxo in Rhosybol at 12:48 BST. Emergency services attended the scene and the driver was taken to Ysbyty Gwynedd in Bangor by ambulance. The B5111 was closed for much of the afternoon and diversions were put in place. North Wales Police is appealing for witnesses.